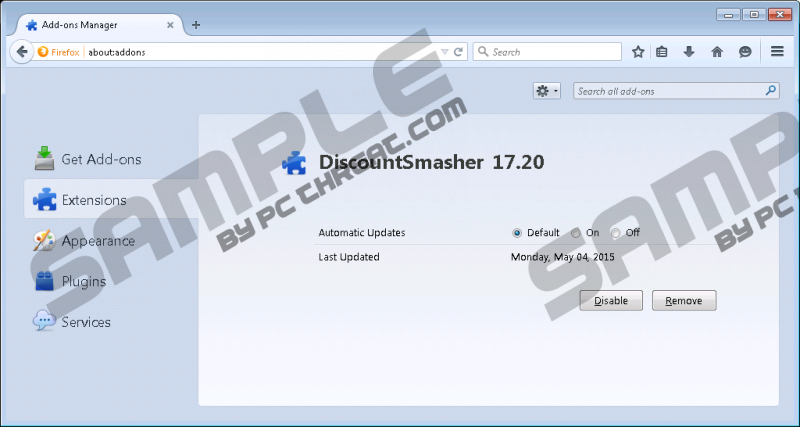 DiscountSmasher is yet another adware application that comes from the Multiplug family. Other adware programs such as RestAdBlocker, BuyFast, DollarSaver and quite a few others belong to this infectious family. Therefore, it is not surprising that DiscountSmasher, just like its counterparts, must be removed from the operating system as soon as it is located running on it. Even though DiscountSmasher could be advertised as an excellent tool that should help you save time and money while shopping online, you must know it does not perform the way it should. In fact, the only thing this adware is only capable of is disturbing you every time you browse the web. In order to keep your PC clean, secure and fully functioning you must remove DiscountSmasher without any hesitation. As soon as this adware gains access to your operating system, your browser will be affected instantly. It has to be noted that DiscountSmasher affects primary browsers suchs as Mozilla Firefox, Internet Explorer, and Google Chrome. This means that no user is entirely safe. All the mentioned browsers will be supplemented with the DiscountSmasher extensions. These extensions are used to provide various third-party ads and annoying pop-ups. While some ads might seem useful at first in reality that are utterly worthless and will in no way help you while you are shopping online. This activity promoted by this adware program is extremely annoying as you will have to fight through them every time you browse the Internet. If you wish to stop this invasive activity, you need to conduct a thorough removal of DiscountSmasher as soon as possible. In order to increase your virtual security, you can take a few preventative steps. First of all you should download your software from official websites only as they do not provide suspicious installers that could be filled with various third-party programs. Often such software bundles are hosted on questionable third-party download websites or websites associated with online piracy. Additionally to practicing safe browsing habits you should implement a reliable antimalware tool, which would warn you in advance about any suspicious websites or downloads. Do not take any chances with DiscountSmasher and use the removal guide provided below to delete this intrusive adware program. Remember that, even though the removal procedure might seem simple, you should execute it with your utmost attention as just one mistake could mean that DiscountSmasher was not removed entirely. This is quite dangerous as it is known that other Internet-based infections could use leftover files or registry entries as a gateway to your operating system. Right-click DiscountSmasher and then select Uninstall. Double-click DiscountSmasher to remove it. Select DiscountSmasher and then click the Uninstall button. Quick & tested solution for DiscountSmasher removal.